I just stepped outside and the lights were on, testing before the actual full run of the Tribute in Lights. It's been 10 years and I'm exhausted by the press, the magazine articles, the photos, everything... it's too much. This weeks New Yorker is 90% tribute to 9/11, an entire issue I cannot read in public because I'll probably be reduced to tears, so my subway ride was 30 minutes of staring blankly or reading nail fungus ads over and over. And now the lights... It made me think of the article in the New York Times this past weekend about memorials, how we pass them and mostly ignore them as they've become commonplace in our society, in particular one memorial I walk by every day, The Prison Ships Monument in Ft. Greene Park. I know why it's there yet I don't think about it every day because I see it every day. Now the lights. 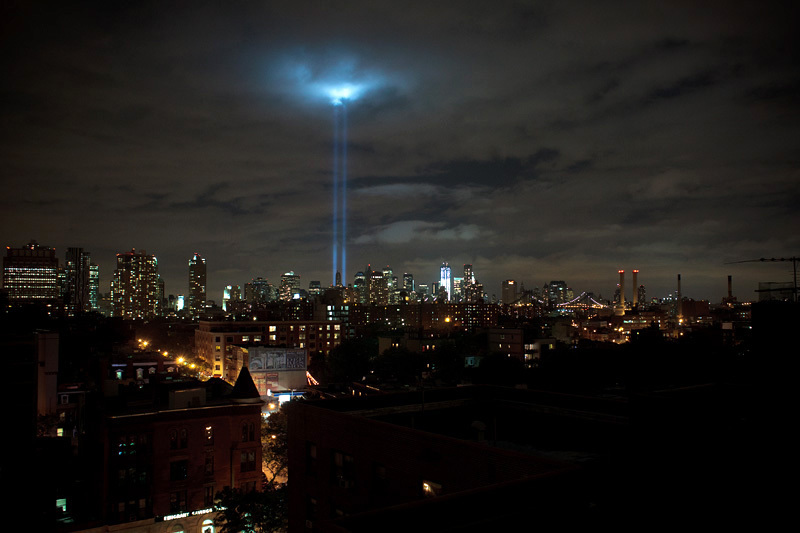 They are only on once a year, testing then all night on September 11th. I love the lights but I wonder if we have to do this every year. At what point can we not bring up such emotions? I personally still carry the full memory, the feelings, the emotions, the visual so close that I dread the rehashing of the day year after year. At a recent visit to St. Paul's Chapel I barely made it through without having to step outside for air. Goosebumps. Clenched fist. Eyes swelling. I tried to talk but it was best to just step outside. I don't want to become numb to the memory, that's hard pressed, but I would also like to go forward. All these thoughts while Mayor Bloomberg and Police Chief Kelly are on TV warning us of another terror threat on the city, "...go about your day tomorrow as usual...". oh okay. sure. Here's a link to my tribute, "What I Had to Do", published in 2002. I have books available if you are interested, still donating 100% to the UFA's Widows and Children's Fund. You can also purchase the book here.